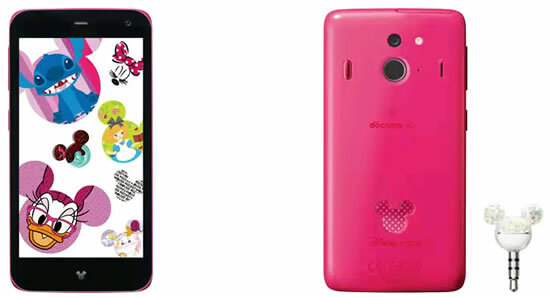 Fujitsu today announced that its new smartphone Disney Mobile on docomo F-03F will be available exclusively in Japan as of December 13, 2013 from NTT DoCoMo. 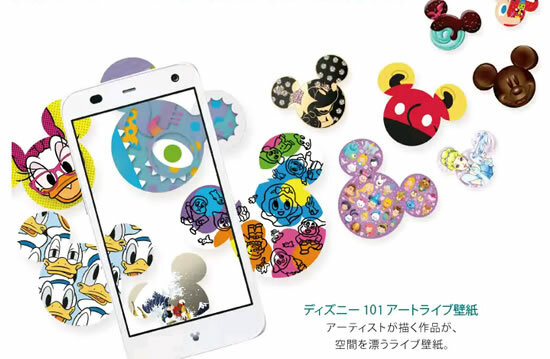 From its colorful design concept to its rich library of preinstalled content, Disney Mobile on docomo F-03F is packed to the brim with the magic of Disney. The F-03F features a full range of high-spec capabilities, including a 13.1 megapixel camera that is great for capturing night shots and illuminated shots; a 2,600 mAh battery enabling over two days of battery life; 32GB of internal memory and water-resistant technology, which even enables users to enjoy using the phone in the bathroom. Other popular features include a 2.2 GHz quad-core CPU, a switch-enabled fingerprint sensor, infrared communications, and Osaifu-Keitai. The rear panel of the F-03F uses a pearl powder coating to deliver a glossy, dazzling finish in Pink, Blue or White. The rear panel’s Mickey Mouse icon features a dotted gradation that gives an appearance of depth and transparency. The accompanying earphone jack accessory is made of polarized pearl, which sparkles in the light, and when plugged into the handset, users can enjoy a different on-screen animation, selected at random from among four different colorful characters. As an added service from Disney Mobile on docomo, customers can gain complimentary access to over 30,000 videos, TV dramas, applications and other content on the Disney Market online store. The phone also comes with a cradle holder that is perfect for viewing photographs and Disney Cinema video content in full color on the phone’s 4.7-inch OLED display, thereby providing users with an opportunity to fully enjoy the world of Disney. The smartphone is equipped with Super Clear mode, which automatically adjusts the brightness and contrast of the screen for optimal visibility – even if the display is under direct sunlight and difficult to read – and an engine that prevents the display from turning off while the phone is being held. Through features such as Touch Lock Mode, which temporarily blocks touch operations even if the screen is touched for easy viewing of videos with kids, the handset delivers a level of convenience only found with Fujitsu. The latest model comes preinstalled with 100 kinds of art content, based on the Mickey Mouse motif, which a team of artists created to bring the world of Disney to life in full color. The phone also comes preinstalled with a host of exclusive content, such as seven kinds of colorful characters and Disney fonts, in addition to updated versions of the earphone jack accessory and cradle holder from previous models. 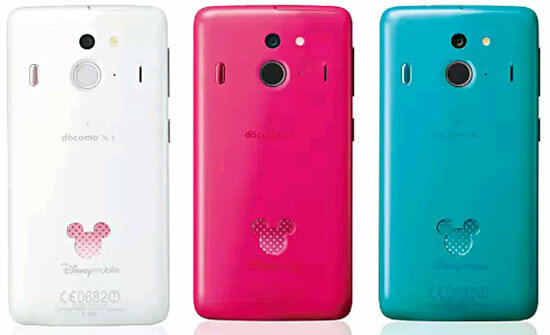 Disney Mobile on docomo F-03F is available in three colors: White, Pink and Blue.